Location formerly cited as NH 33766 03612. For Aberchalder swing bridge (NH 3384 0352) and (successor) Bridge of Oich (NH 3368 0349), see NH30SW 9 and NH30SW 10 respectively. For Bridge of Oich Cottage (adjacent to NW), see NH30SW 48. (Location cited as NH 337 036). 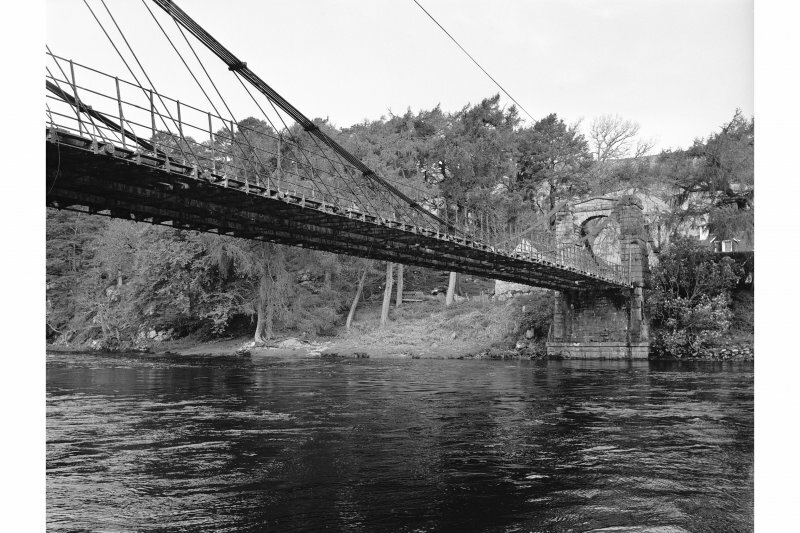 Bridge of Oich, built circa 1850, probably by James Dredge. 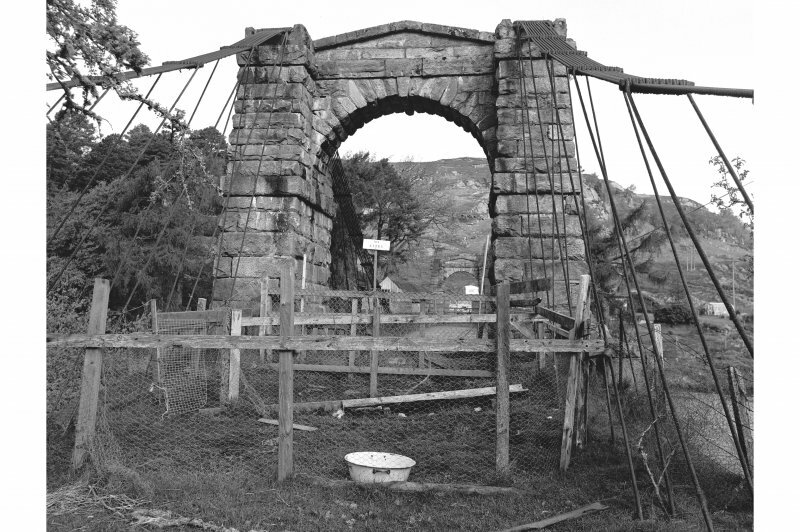 A double cantilever chain suspension bridge of the Dredge type, with coursed bullfaced rubble battered pylons linked by round-headed pedimented arches. Wooden decked bridge. 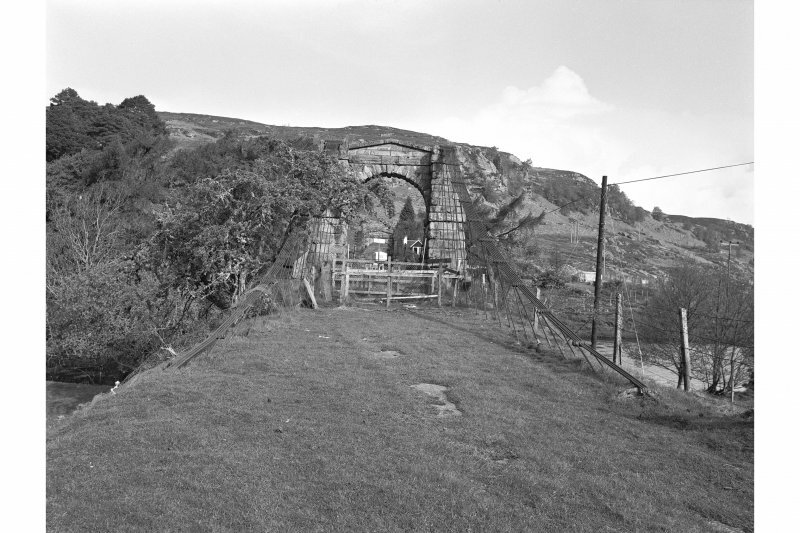 Bridge is now disused (1983). 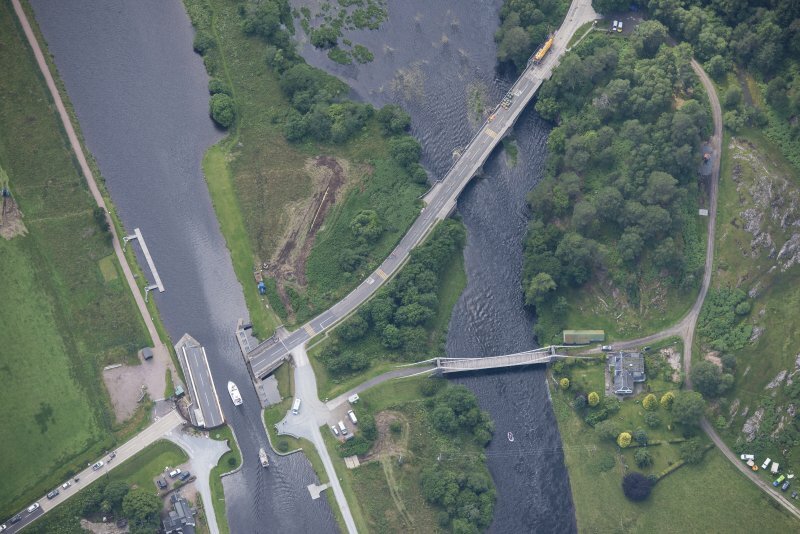 Similar to Dredge bridges [NH64SE 50 and NH64SE 51 ] at Inverness. SDD List; J R Hume 1977. 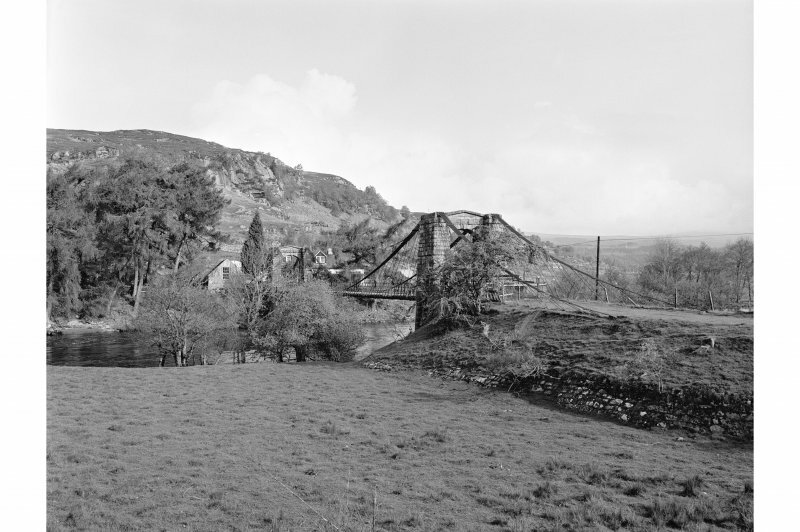 This bridge formerly carried a public road over the River Oich at Aberchalder. Information from RCAHMS (RJCM), 22 July 1997. NH 337 035 In advance of refurbishment of this bridge, which is a scheduled ancient monument, the opportunity was taken to examine the original road surface. A single metalled surface of fine gravel was found. It was not clear if this was the original surface or a replacement added before the road and bridge were replaced this century. 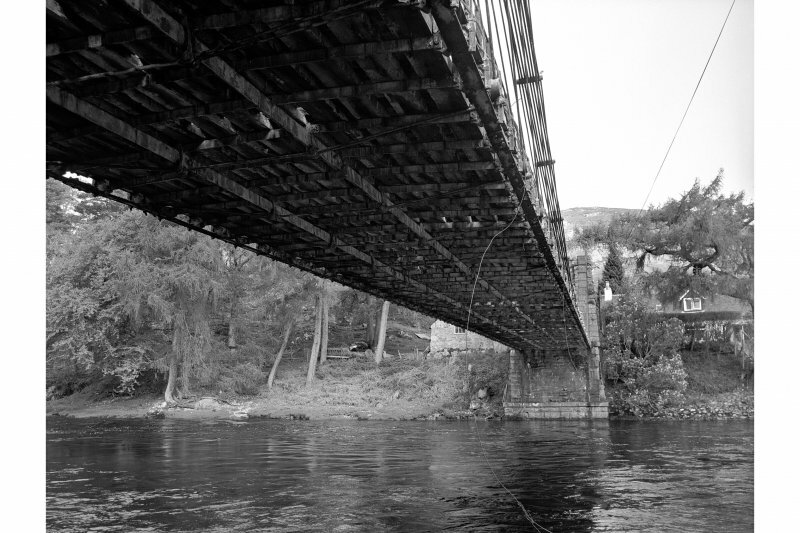 A RCAHMS photographic Survey was undertaken, during March 1999, to record the restored nature of the bridge. 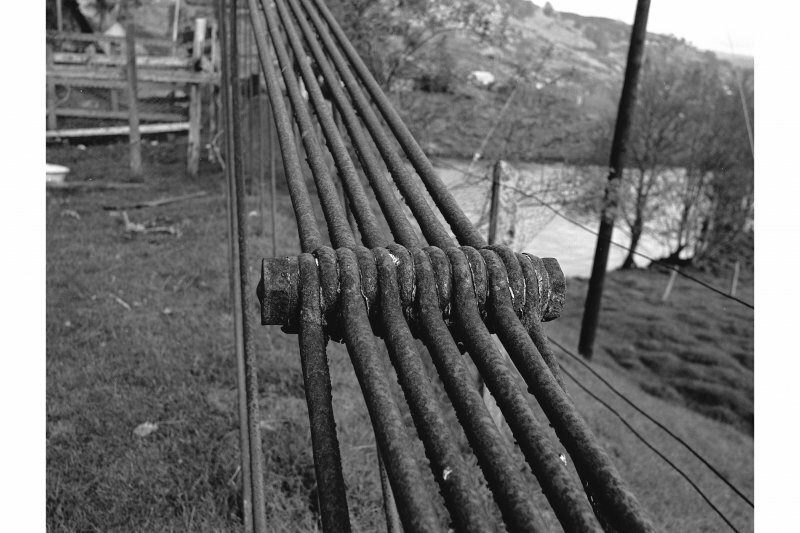 As a Dredge bridge, this bridge should not be described as a suspension bridge, as is the case currently in the NMRS database. 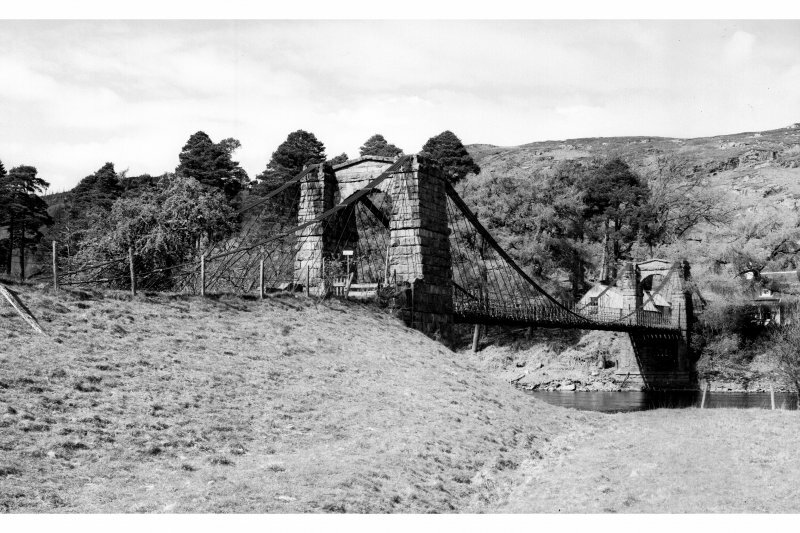 Its name should therefore be changed to 'Bridge of Oich', or the Historic Scotland name of 'Old Bridge of Oich'. 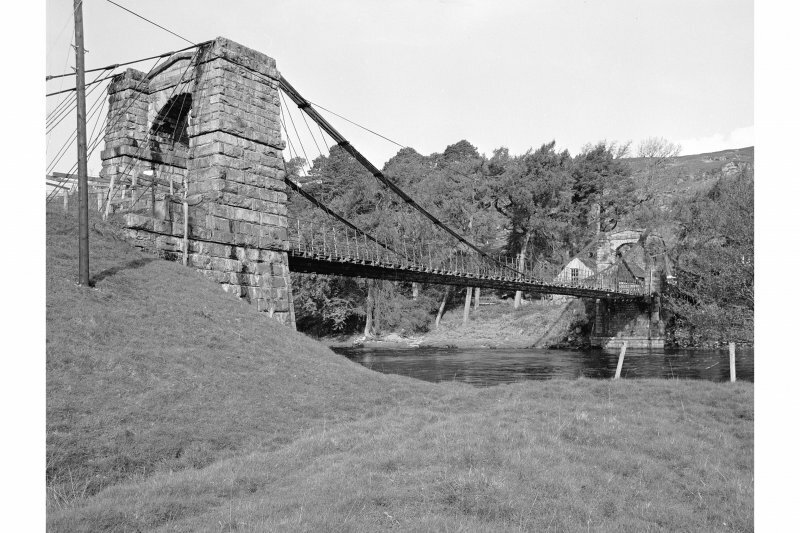 The 'Old Bridge of Oich' was replaced or bypassed by the three-arched concrete 'Oich Bridge' (NH30SW 9 and NH30SW 10 ) in 1932, which now carries the A82 trunk road over the River Oich. This bridge carries the former line of the A82 (T) public road over the River Oich at the N end of Loch Oich and to the W of the Aberchalder Swing-bridge (NH30SW 9.00). The successor and present Oich Bridge (NH30SW 10) is adjacent to the S.
The location assigned to this record defines the apparent midpoint of the structure. The available map evidence suggests that it extends from NH c. 33754 03625 to NH c. 33785 03594. Bridge crosses the parishes of Boleskine and Abertarff, Inverness and Kilmonivaig, Lochaber [Incorrect: within parish of Boleskine and Abertraff]. Formally re-opened to pedestrian traffic in September 1997 following refurbishment by the company, Halcrow. The refurbishment took two years, at a capital cost of £280,000, the quoted value of associated 'services' being £40,000. The company described the project in the following 'Technical Description'. 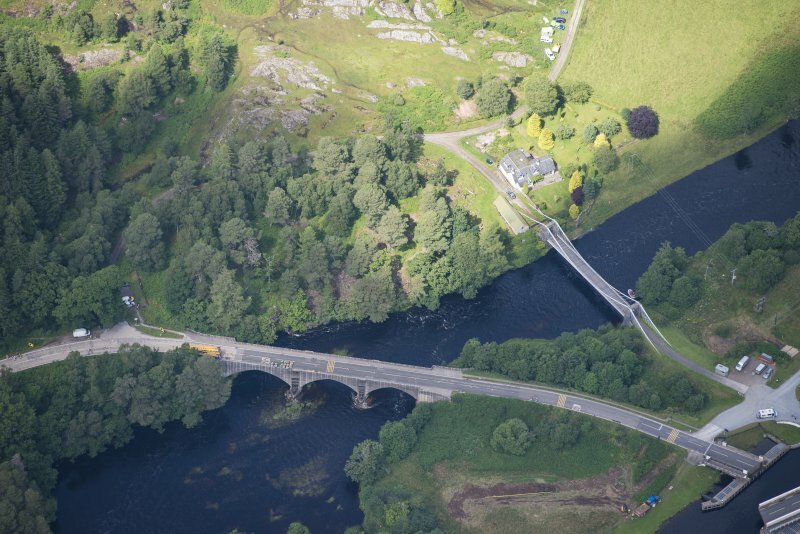 'The Bridge of Oich was designed and built by James Dredge of Bath in 1854 and spans some 46m across the River Oich. The bridge is a suspension bridge in concept using a wrought-iron chain which reduces in cross sectional area from the main support positions to the centre of the bridge by omitting one bar from the chain at each suspension rod position. This bridge concept patented by Dredge in 1836 represents a very significant development. 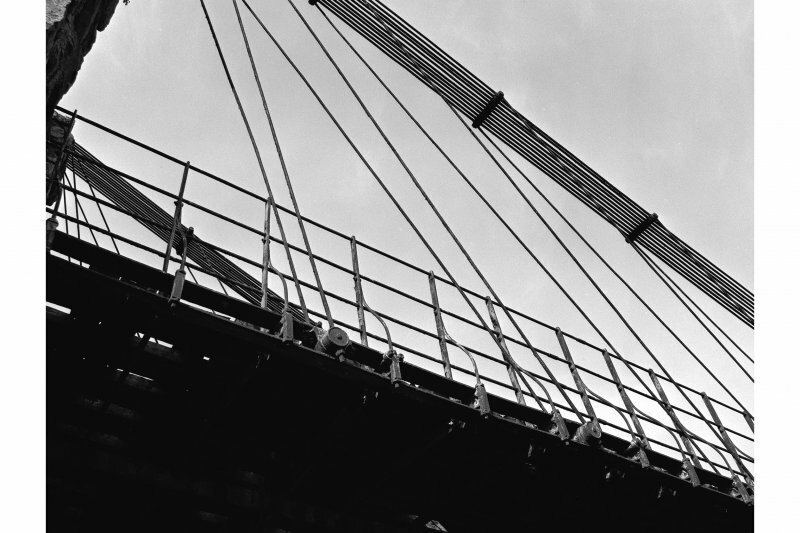 His design resulted in a dramatic reduction in the amount of iron used in the suspension system and shortened significantly the erection time of a bridge deck. 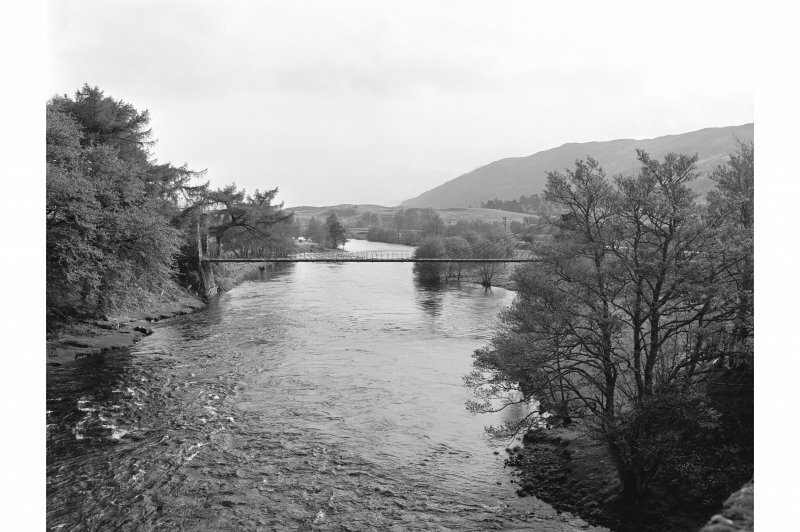 Bridge of Oich is understood to have been open to 'traffic' until construction of the concrete-arch bridge some 80m upstream in 1932. 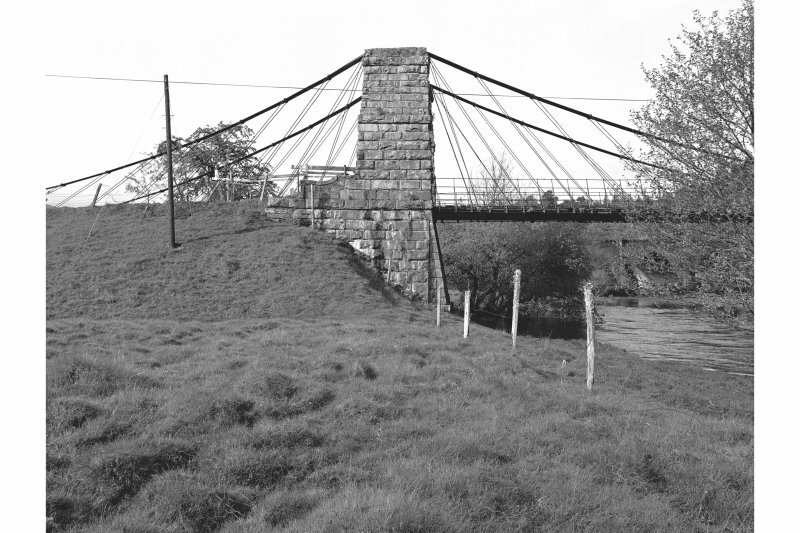 In recent years this Dredge bridge had deteriorated and, at the point of acquisition by the Secretary of State, was one of only seven bridges still standing out of some 30 bridges built by Dredge and recorded by the Institution of Civil Engineers. Inspection of the bridge included testing of wrought iron, identification of timber species, excavation of ground anchors with archaeologist in attendance, identification of existing paint system, inspection of abutment core by the removal of a masonry block and identification of original mortar composition. Structural assessment indicated that strengthening was necessary and that live load would require to be restricted to 1.0kN/m squared if structural form was to be retained. Strengthening proposals were developed which are very discrete and conserve the original components and the overall appearance of the bridge. 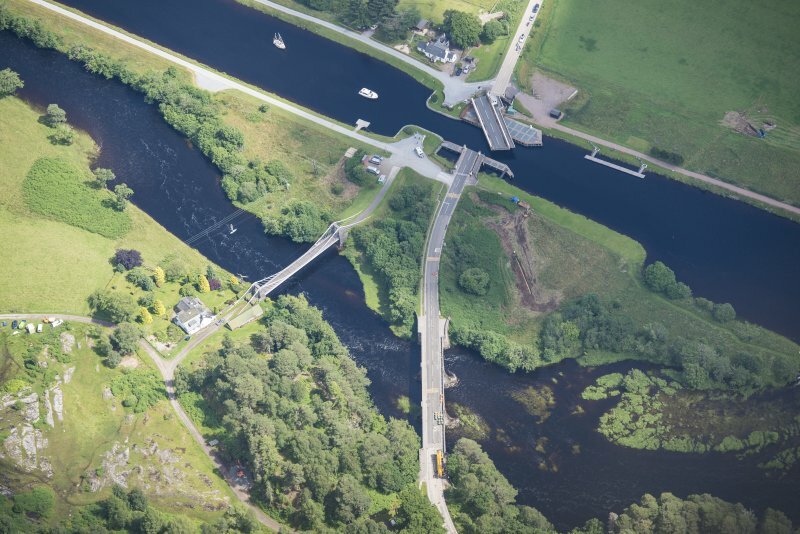 The contract involved the resolution of safe access over a river subject to flood. It was also necessary to safely remove the existing lead-based paint systems without polluting the environment or endangering the health of operatives. Risks were identified in the Health & Safety plan, prepared by Halcrow H&S Ltd, in accordance with the CDM Regulations. 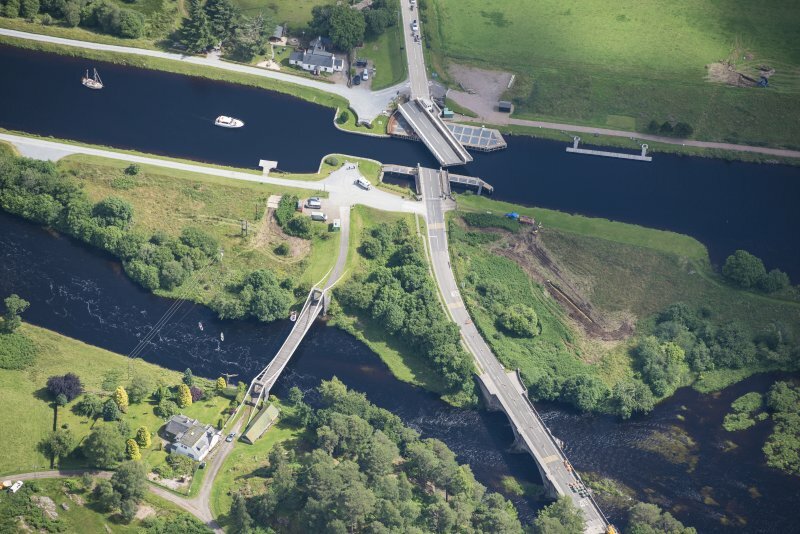 Source: Halcrow Project Data Sheet entitled 'Bridge of Oich Refurbishment', issued by the company at the official re-opening of the bridge in September 1997. NH 3376 0360 A series of small trenches were opened by Kirkdale Archaeology on the Oich suspension bridge (NMRS NH30SW 11) in advance of groundworks to strengthen the poles anchoring the bridge in place. Forty-eight of the anchors were uncovered, alongside possible traces of an earlier surface below the present tarmac. 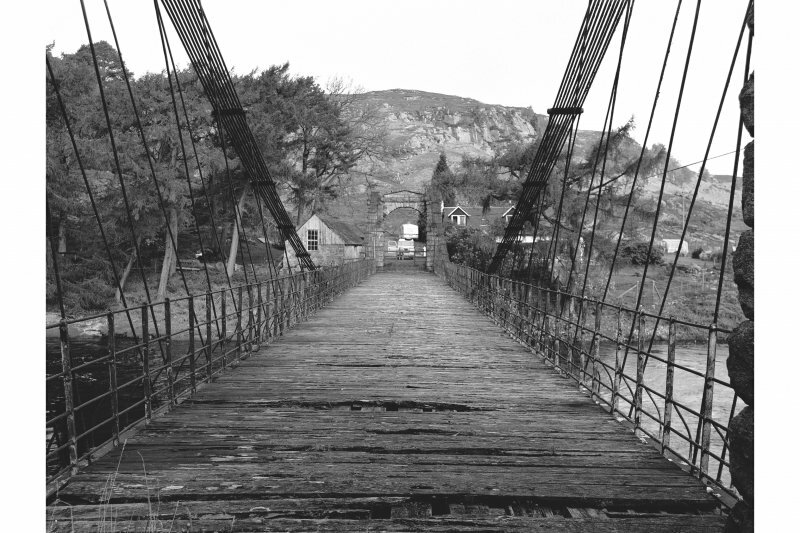 This economical suspension bridge over the Oich was erected by James Dredge of Bath in 1850, and tastefully refurbished by Halcrow-Crouch and Morrison Construction for Historic Scotland in 1997, attracting a conservation award from the Saltire Society in 1998 on the recommendation of the Panel for Historical Engineering Works. The Panel had encouraged Historic Scotland to refurbish the bridge following the sudden demolition of Dredge’s Ness Islands bridges in 1990. 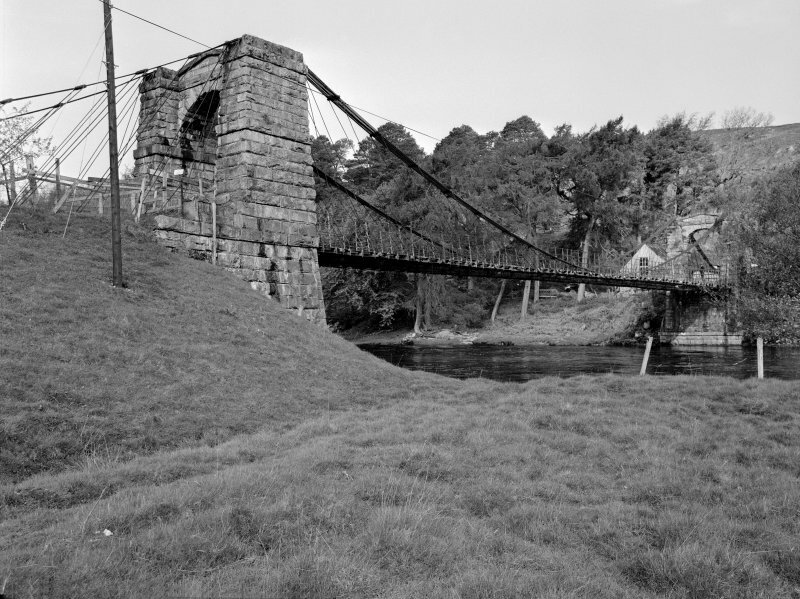 Victoria Bridge carried mainroad traffic until bypassed by the present concrete bridge in 1932, after which it ceased to be adequately maintained and was eventually closed. 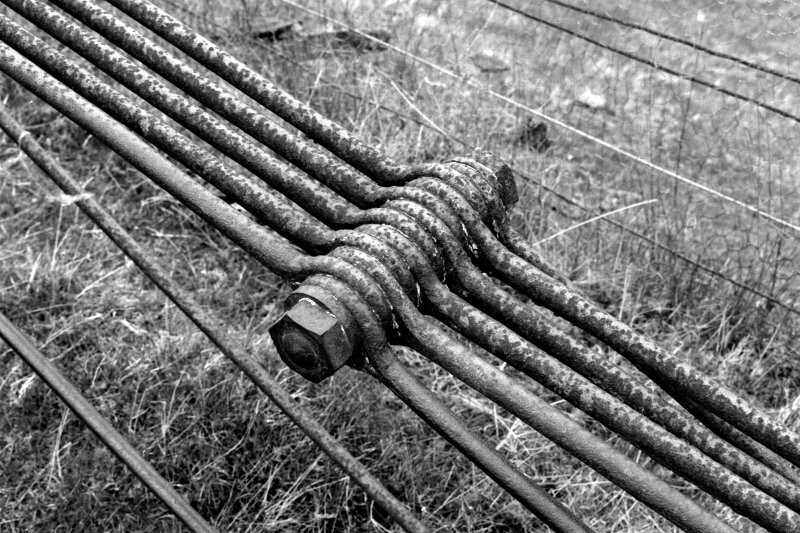 these chains consist of 12 rods in parallel, reducing progressively in number towards mid-span. A similar arrangement exists on the landward side of the towers, with the chains being anchored below ground level. Trussed wrought-iron transoms support the decking transversely. 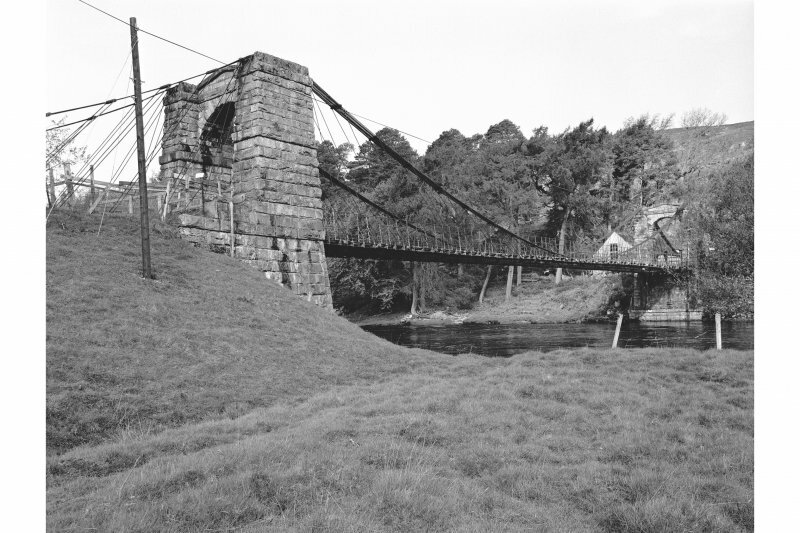 Dredge constructed 50 bridges of this type from 1837–54 of which this is now the best surviving example in Scotland. One of his Ness Islands footbridges, Inverness, dismantled in 1988, was re-erected in Whin Park, Inverness, but with its deck propped. 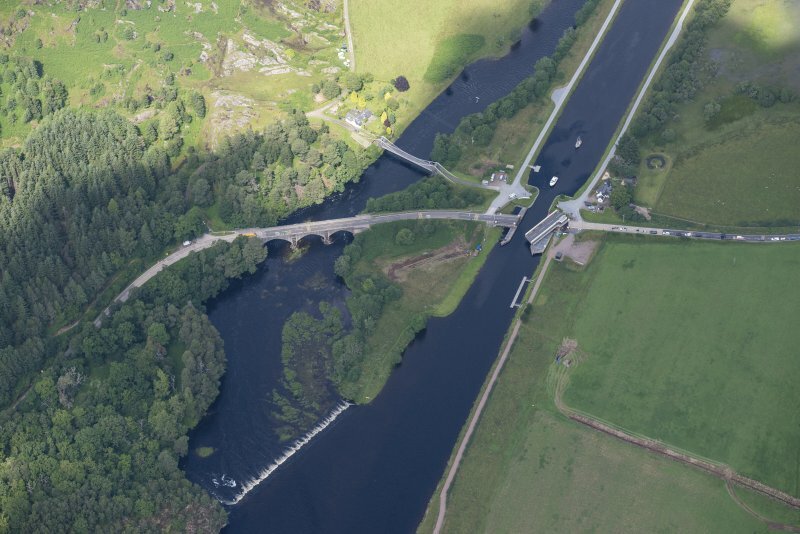 Dredge’s largest span Scottish bridges were over the Clyde at Blantyre and Victoria, Lochaber, Fort William, over the Lochy, which was of 250 ft span and 17 ft wide, replacing the ferry. 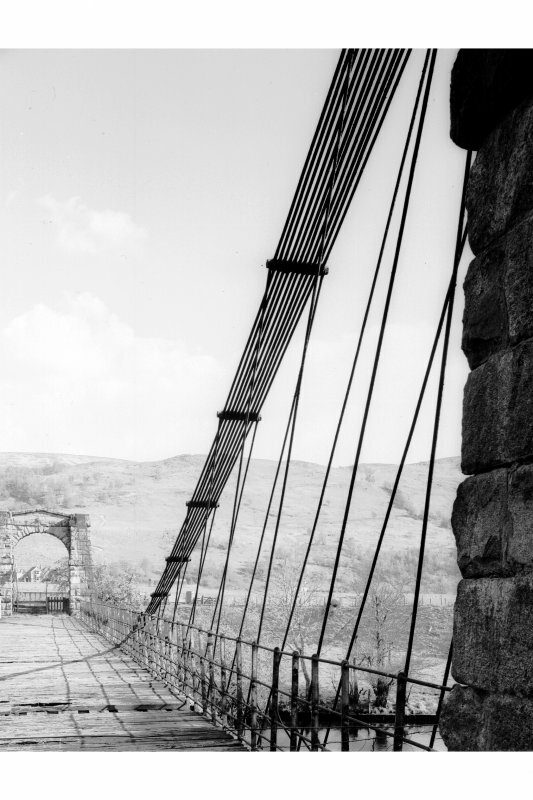 It was erected in 1849 for a cost of less than £2000, compared with £8000 for a stone bridge, and served for 98 years.